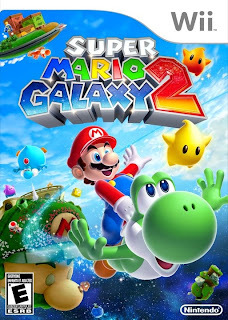 Super Mario Galaxy 2 was certainly an unexpected announcement from Nintendo, considering the series past releases. On N64 we had Super Mario 64 (SM64) and on the Gamecube we had Super Mario Sunshine. 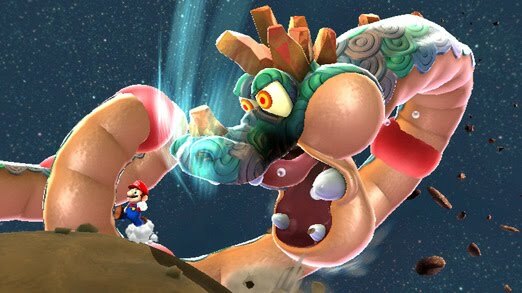 Super Mario Galaxy 2 breaks the trend both by releasing another main series 3-D Mario on the same platform, and by making it so closely related to its predecessor Super Mario Galaxy. The most obvious aspect of Galaxy 2 is that it is built completely off of the original Galaxy's engine. Thus, instead of reinventing the wheel for their newest title, the development team was able to focus completely on making improvements and crafting the best game possible. Now, the level design is more focused, interesting, and varied than ever before — the best aspects of Galaxy have been amplified, the lesser portions revamped or tossed aside, and new gameplay mechanics have been introduced that show off the skills of the team. The player is thrown enough gameplay mechanics to keep the game constantly interesting without any one element sticking around too long. 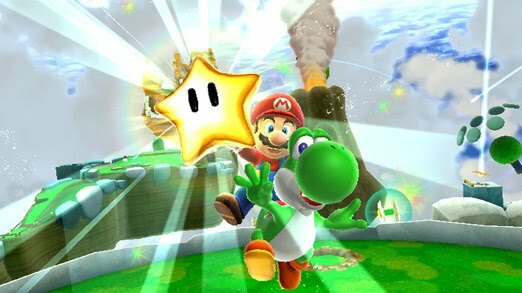 The addition of Yoshi is much more than Mario fan service, as he plays an important role in the game; his abilities are interesting and the control tight. Yoshi's presence in New Super Mario Bros Wii felt tacked on as he had too few appearances; I actually remember talking to someone who had played the game, but forgot that Yoshi was even in it. Here, the dinosaur gets plenty of exposure, but not enough to make the game too Yoshi-centric. The only Mario power up that I could really do without is Spring-Mario; awkward controls and its small role in the game could have been better used giving other powers more time in the spotlight. Thankfully, the difficulty has been kicked up since Mario's last 3-D outing, as the easiness of the original Galaxy was one of my main issues with it. The only times it was very hard were when you were searching around for purple coins, but the platforming itself was too simple. While much of Galaxy 2 isn't very different from Galaxy, there are plenty of challenging spots. Purple coins, timed challenges, and stages populated by these infernal mini-Mario enemies can be delightfully tricky, but the hard parts are not reserved for such bonus areas. The difficulty in Galaxy 2 is comparable to Sunshine, besides a few of Sunshine’s infernally hard platforming stages. One interesting aspect of the game is the attempt at expanding the audience through gameplay help. When this was first announced, gaming blogs and forums were already making a huge fuss over it, but honestly in the game it is completely unobtrusive. If you are continually dying in one stage, Roselina asks if you require assistance. That is it. There is no hand-holding or dumbing down the gameplay at all. If you wanted some help then the option is there, but completely ignorable. While I never used the feature, I read that stars collected by having the game play for you are not in the usual gold, but instead a bronze star to differentiate between legitimate victories. Galaxy 2 has stronger gameplay diversity that the preceding game- There are the stages built around collecting purple coins, often with time limits. There are timed challenges given to you by a chimp with shades. There are ball rolling levels, flying levels, and all kinds of different gameplay. Often timed and collecting stages in games feel like distractions from the main quest in a game, but Galaxy 2 manages to blur this line by keeping everything fun and nothing feeling extracurricular from the normal play. Even simple concepts such as timed speed-runs of previous missions or single HP boss fights come off as completely legitimate and entertaining additions to the game. An atmosphere of delight has been achieved in Galaxy 2 that I have not felt since Super Mario World 2: Yoshi's Island for SNES. Everything about the game contributes to an overall aura of joy and whimsy. The music is beautiful with even more studio pieces and high quality synthesized compositions, and while the arrangements of classic Mario music are present and fantastic, they don't overshadow the impressive new scores. I'm also personally very happy with the upbeat big band influence on the soundtrack. The graphics are the same as the original Galaxy, but with certain visual flourishes that make this game stand out even further. It may not have that HD goodness of the other consoles, but the creativity and aesthetics stand out as something more appealing and inspired than a lot of what is out on the market. The game has a certain energy and excitement to it, thanks to the masterfully crafted level design, well-focused linearity, and appropriate music and visuals. 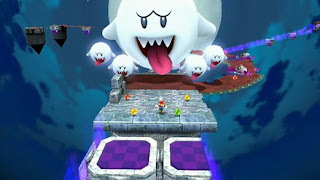 Certain moments are especially captivating — blasting through the star-lit sky toward the next planet, turning the watery world of “Cosmic Cove” into solid ice and looking down at the now-frozen world below, navigating the dangers of “Supermassive Galaxy”, watching the flowers grow underneath Mario's feet ... There were many moments in the game that I just had to pause for a moment, forget about the mission, and just appreciate the spectacle. I know many will disagree, but I can't help but question the inclusion of “Throwback Galaxy” — a SM64 stage slightly remixed but enhanced with Galaxy graphics. It is gorgeous and an interesting look at how the game would look if made today, but I dislike that kind of obvious fan pandering. Having arrangements of classic Mario music is great, but duplicating entire levels is a little too nostalgia-fueled for my liking. It isn't a big deal though, as most people will love it, and it's too unobtrusive to be that offensive to cranky gamers such as myself. If I wanted to play SM64, though, I would be playing SM64. The story of the game is hardly worth mentioning, but people seem to find it enjoyable to make fun of its simplistic tale (as if anyone plays Mario for the plot). The important thing is that it fits right at home with the atmosphere of the game, and doesn't have any significant standout cheesiness. It gives a reason for the gameplay without any annoying intrusions, and that is all I require from most platformers. I was admittedly skeptical at first towards Super Mario Galaxy 2. Super Mario 64, Super Mario Sunshine, and Super Mario Galaxy were very different from each other and worked together to create a franchise that could vary wildly across the games. I was worried that the magic would deteriorate with Galaxy 2 being a rehash of the first. Fortunately, I was wrong; sure, it's the same assets and engine, but if that allows for more creative design and attention to detail then I welcome it. After all, was not my favorite Zelda game — The Legend of Zelda: Majora's Mask — even more guilty in that regard? The game not only ran on the same engine, but re-used character models by giving them new names! What the game delivered was an adventure with more exploration, more character interaction, and a more sophisticated overall production. If it allows for games such as Majora's Mask and Galaxy 2 then I hope the next platform's big series get a second game using the same engine. Unfortunately, Galaxy 2 was unable to launch with the same impact and excitement that surrounded Galaxy. With its strong similarity to the first game, it isn't revolutionary, but it is certainly an evolutionary title in that it expands and fine-tunes what Galaxy started. Many gamers have either skipped out on Galaxy 2 or at least put the purchase on hold, unable to get enthusiastic over a second serving of “Mario in Space”. I hope that it will be remembered, though, as not the “other” Galaxy, but the “better” Galaxy. Evan Krell, a.k.a. "The Other Evan," plays retro and indie video games while balancing a love of '80s/'90s mecha anime and those scary moé shows. You should totally follow him on Twitter.